Zendesk is a suite of support apps that helps transform your customer service into agents for customer retention and lead source. It has one of the most flexible plan structures, making it ideal for business of any size. It consists of call center, support, and chat solutions and knowledge base modules that you can upgrade separately. However, its support plans include the basic versions of a call center, chat, and knowledge base, so you get all sides covered right off the bat. This setup affords a startup or small business to implement at once an industry-class help desk. They can easily upgrade to more advanced tools like CSAT surveys, web SDK, IVR phone trees and answer bot as their business requirements get complex. 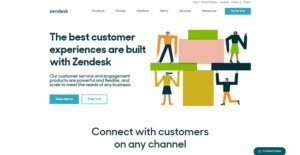 One of Zendesk’s more popular solutions is Zendesk Talk, which is a robust call center software integrated into its Support ticketing system. It enables service teams to deliver personalized and efficient phone support across multiple channels in the journey of clients. This app gives you the option to set up a call center with web, mobile and messaging channels. This is ideal for highly engaged customers or prospects; your agents can quickly connect to them via automated trigger. Through the Zendesk Call Center’s integrated live chat, your customer support teams can also drive high levels of customer engagement on your online sites. Among its smart features is its reports and analytics tool, which provides powerful insights on how your support teams handle every conversation with your customers. Overall, Zendesk Talk helps customer support agents enhance and measure phone support activities, resolve problems more quickly, and provide quality customer engagement on an omnichannel environment. Zendesk Support puts all customer interactions in one dynamic interface for an efficient, seamless process. You can bring in customer queries from almost any channel via pre-defined ticket responses, web widgets, and customer search history, allowing you to respond faster and with the right context. The main module can also be customized to fit your customer service workflows or apps that you’re already using. It also features customer satisfaction ratings and analytics via performance reports and dashboards. The software also lets you develop institutional knowledge culled by your customer service over the years. The Guide module helps you build a help center, online community and customer portal. You can direct FAQs and low-touch tickets to this portal, while your agents deal with high-value customers and sales leads. An AI Answered Bot can also direct queries to relevant articles in your base, squeezing out more ROI off your content marketing budget. Its latest app to date, Zendesk Message levels up your chat support by engaging customers in their favorite messaging apps. Instead of waiting on your website for prospects to ask questions, this tool allows you to follow them wherever in social media they are mentioning you. The message tool integrates with Facebook and Twitter and is available through the Chat module. Zendesk is a comprehensive suite of support apps that you can scale as your business needs grow. You can treat it as an end-to-end solution, structuring around it a call center, help desk, live chat, knowledge base, and community portal. Or you can start with the main support module and build your support architecture along your budget line. The main support module comes with the Lite version of call center, chat, and knowledge base. You can say you’re getting these add-ons for free so your help desk doesn’t start bare, rather, it rolls out built with industry-class tools. The whole pricing setup of Zendesk lends to your support reliability and scalability, and to your cash flow flexibility. Zendesk is more than just a help desk. It crosses over to CRM because it allows you to organize processes, workflows and tracking of customer engagement. On its own the software can turn your huge volumes of support data into a treasure trove of leads, opportunities and market insights. Zendesk helps you consolidate these data and leverage them to build or nurture long-term relationships with your customers. Zendesk allows you to build a self-service customer portal using its knowledge base and community features. Combined with the AI-powered bot that can direct FAQs and low-touch tickets to the portal, the self-service feature takes repetitive work off your agent’s shoulders, so they can focus on high-value tickets and promising leads. It levels up efficiency in your customer service workflow. The software has all the key features you need in a powerful help desk solution. It’s got ticketing system, knowledge base, community forums, call center, live chat and messaging tool. You can build an efficient and powerful customer service process around this structure, if not at once, one module at a time. For IT assets, Zendesk offers an ITIL-ready IT Help Desk edition. Likewise, it integrates with important business solutions like CRM, salesforce automation and over 600 apps in its marketplace. There are well-liked and widely used applications in each software category. But are they necessarily the best fit for your company’s special requirements? A trendy software product may have thousands of customers, but does it present what you need? For this reason, do not blindly shell out for popular systems. Read at least a few Zendesk reviews and mull over the factors that you want in the software such as the fees, main tools, available integrations etc. Then, choose a few systems that fit your requirements. Try out the free trials of these platforms, read online comments, get information from the vendor, and do your research systematically. This profound homework is certain to aid you select the best software application for your organization’s unique requirements. We realize that when you make a decision to buy Call Center Software it’s important not only to see how experts evaluate it in their reviews, but also to find out if the real people and companies that buy it are actually satisfied with the product. That’s why we’ve created our behavior-based Customer Satisfaction Algorithm™ that gathers customer reviews, comments and Zendesk reviews across a wide range of social media sites. The data is then presented in an easy to digest form showing how many people had positive and negative experience with Zendesk. With that information at hand you should be equipped to make an informed buying decision that you won’t regret.